The Book of Hebrew Script signifies a new phase in the study of the Hebrew letters. 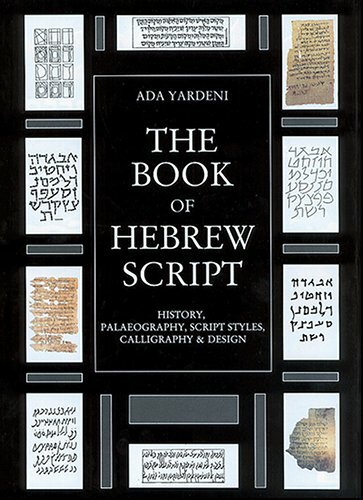 In addition to a comprehensive historical survey of the evolution of the Hebrew script and its various styles, the author presents the basic rules of Hebrew palaeography, and a method for analyzing letter-forms, as well as instructions for Hebrew calligraphy and the design of Hebrew letters, inscriptions and typefaces. This book is the perfect manual and source of information for scholars and laymen alike. If you have any questions about this product by Carta Jerusalem, contact us by completing and submitting the form below. If you are looking for a specif part number, please include it with your message.